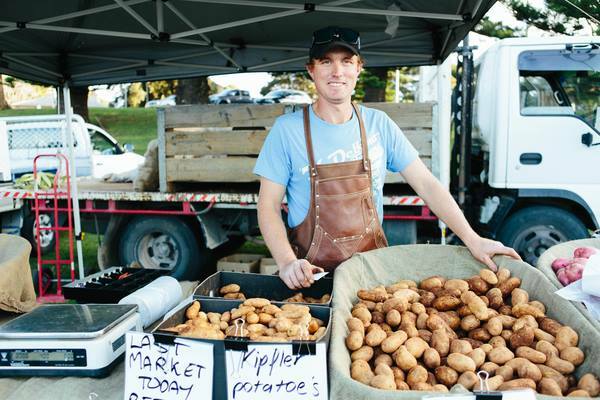 Patrons of the Kiama Farmers’ Market at Surf Beach are being encouraged to help the traffic and parking situation on Wednesday afternoons by avoiding Manning St and making use of the large carpark at the Showgrounds. Working with Council, , following feedback from local businesses, the Market has put a variety of initiatives in place to encourage shoppers to park there, even supplying a traffic marshal to encourage the flow of traffic. “We’re encouraging people to avoid the crawl down the street looking for an elusive park,” says the Market’s Manager, Tricia Ashelford. “It’s a lovely paved walk along the water, so we think it will only add to the visit. The traffic situation is being exacerbated by work on the large Bathers’ development and the unrestricted parking on the beach side of the street. The holiday season will also see more people setting up on Surf Beach for the day.